This is one of the monarch's official homes and the largest inhabited castle in the entire world. 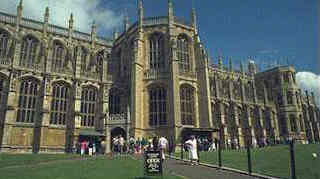 It is situated in Windsor, which is a town on the River Thames, just to the west of London. The castle consists of three enclosed areas, called "wards". The upper ward forms the "royal" part of the castle - the monarch's personal apartments and state rooms. Then there is a middle ward, which is a military region, and finally a lower ward, which is open to tourists. The lower ward also contains the magnificent St. George's Chapel and the College of St. George, which is a school. The original castle was built in 1070 by William the Conqueror. It was basically just a mound with a circular tower on top. It's purpose was simply as a fortress, and not as a palace or a royal residence. The round tower still survives from that period. Edward III was the first king to turn Windsor Castle into a palace. He held a magnificent tournament at Windsor in 1343, to which knights and aristocracy from all over Europe were invited. At this tournament, he made an announcement - he was going to set up a new version of Camelot at Windsoe, with himself as the new King Arthur and 300 new Knights of the Round Table. He even planned to build a huge circular tower, 200 feet in diameter and place a huge round table in it. The round tower was built in a great hurry, by Edward's chief mason, William of Ramsey and his chief architect, William Hurley. The round table itself was postponed, as England was now at war with France. The tower was later torn down by Charles II, who also dismantled the great hall that Edward built, and the materials were reused in later building work. In 1348, Edward announced that he was going to create a new order of chivalry - the Order of the Garter. A garter is an elastic band used to hold up women's stockings, and one legend has it that Edward rescued a women's garter after it had fallen down, and then placed it on his own leg, saying that soon men would be proud to wear such an item. This is almost certainly fantasy - actually the origins of the Order of the Garter are shrouded in mystery, as is the reason for its motto "Honi soit, qui mal y pense" ("Dishonour be to he who thinks evil"). The Order of the Garter still exists. It is limited to 26 nobles, and the only way for anyone to be promoted (on the monarch's command, of course) to the order is if a "vacancy" becomes available by one of the nobles dying. Once a year, the 26 knights of the garter parade round the outside of Windsor Castle in a display which is viewed by thousands of tourists. One part of Edward's Windsor Castle that did survive was his magnificent St. George's Chapel, which forms a large part of the lower ward. Work began on building the chapel in 1475. Decorating the stalls inside this chapel are the coats of arms of every knight of the garter that has ever lived. For 300 years, Windsor Castle remained almost unchanged until Charles II made massive changes to it in the 1660s. He basically tore down the medieval castle because it had unfortunate associations for him - his father, Charles I, had been imprisoned there shortly before his execution in 1649. Indeed, in 1642 at the start of the Civil War, the town of Windsor had declared its support for the Parliamentarians, and roundhead soldiers had seized the castle. 60 royal prisoners (including Sir Edmund Fortesque, the Duke of Devon) were held prisoner there. Fortesque even carved his name into the stone work of the room that he was locked in. In 1647, Oliver Cromwell prayed in the chapel at Windsor from 9 in the morning to 7 in the evening. He was trying to decide whether to support the execution of the king or not. 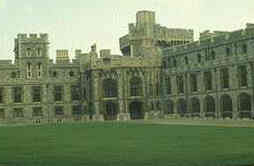 Windsor was then the most secure prison in the kingdom and Charles was being held there. After his execution in London, Charles' body was brought back to Windsor and buried in the same vault under the chapel floor as Henry VIII and his wife Jane Seymour. The royalists had to locate this vault in the dark of the evening by tapping on the tiled floor of the chapel until they heard a hollow ringing. Then Charles' body was carried by soldiers to the end of the chapel. Under Cromwell's rule, Windsor Castle fell into decay. It became a doss house, occupied by poor peasants from the local town. When Charles II came to the throne he completely rebuilt Windsor Castle, modelling it on the lavish palaces he had seen in France during his exile. He included a grandiose set of 16 state apartments, leading from large public rooms (such as the Queen's Presence Chamber, where the queen would meet delegations of visitors), through ever more intimate rooms (such as the Queen's Privy Chamber, and the Queen's Gallery) to the King's closet and bed chamber. There were strict rules as to who was allowed to enter each room, and the number of people allowed to go further diminished as you went into successive rooms. In fact, Charles II didn't actually sleep in the King's bed chamber. There is a secret door in one corner of the room, leading to a back stairway and a secret exit from the castle. He would slip out at night and stay with his favourite mistress, Nell Gwynne, who owned a house just outside the castle gates. 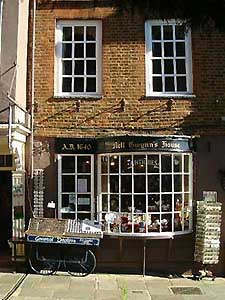 Her house is now a shop, as shown in the picture on the right. Here is a picture of Nell Gwynne herself. Under the Hannoverians, the castle again fell into decay. George III had a small house built for himself and his family 30 yards from Windsor Castle, and during his reign the lower ward was used as a town square by the town residents. However, his son, George IV had much grander plans. He was the last king to make huge changes to the castle. He had the small house his father had built torn down and had the castle rebuilt as a glorious royal fantasy world. During the regency period, when George IV reigned in place of his father, who was considered mad, the mad king was imprisoned in Windsor Castle. He had the plain facade of the castle walls that had been put up by Charles II covered with gothic decoration, and had a hollow "crown" placed round the top of the round tower. He had a 3-mile long straight road (called the Long Walk) built extending from the front of the palace and placed a statue of his father, George III, at the far end, dressed as a Roman Emperor, sitting on a horse. George IV also delighted in the grounds that surround the castle, Windsor Great Park. These cover 3,500 acres, and one visiting foreign prince described said "It is like a private kingdom". George had his own private zoo constructed, and walled off a large area of the park to protect himself from the public gaze - he valued his privacy intensely. Nowadays, the park contains Grace and Favour homes (which are homes given to trusted servants of the crown who have retired) and also servants' cottages. There is a large lake, Virginia Water, in the middle of the park, and on its shores, George had a ruined Roman temple reconstructed, which he called the Private Temple of Augustus. He had been presented with some Roman columns from the town of Leptus Magna in North Africa, and these were used in the construction of his mock temple, which he used for picnics and to entertain his friends. Windsor Castle has not changed much since the reign of Geore IV. Queen Victoria lived happily there with her husband, Albert, and they are both buried there, side by side in their own private chapel in the grounds, called Frogmore. Her son, the Duke of Clarence, is also buried in that chapel - indeed most dead royals since then have been buried somewhere at Windsor. Even the Queen Mother is buried at Windsor. In 1992, a huge fire broke out in the main castle building, probably caused by an electrical fault. This swept through the state rooms, destroying many priceless works of art and completely gutting St. George's Hall. The castle has since been rebuilt, not entirely in the same style as George IV's hall, but as a compromise between nineteenth century and a more modern style. 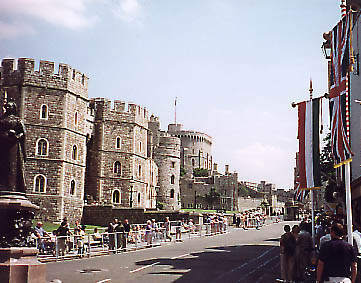 This is a view of Windsor Castle looking up the street called Castle Hill. The large gate that you can see in the castle is called King Henry VIII's Gate.